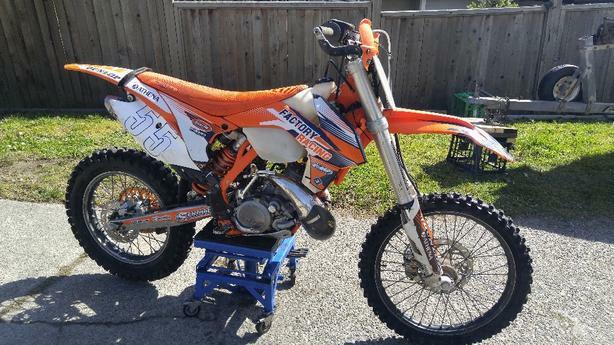 Hers is your chance to own a rare KTM 200 XCW. This is a sweet woods weapon .I once did a wheelie and pretty much got a woman preggo. New pads front and rear. FMF gnarley pipe and titanium 2 shorty silincer. Recently replaced RK gold chain. like the one Mr T would wear. New front and rear sprokets. Top end repaced at 230hours there is 280 total crank was tight when top end was done . Cycra hand guards ,Devol rad guards ,Emperor skid plate .P3 carbon pipe guard . I can also include a full set of used but still totally decent plastics ,stock pipe ,stock seat , and everything you see in the photos .